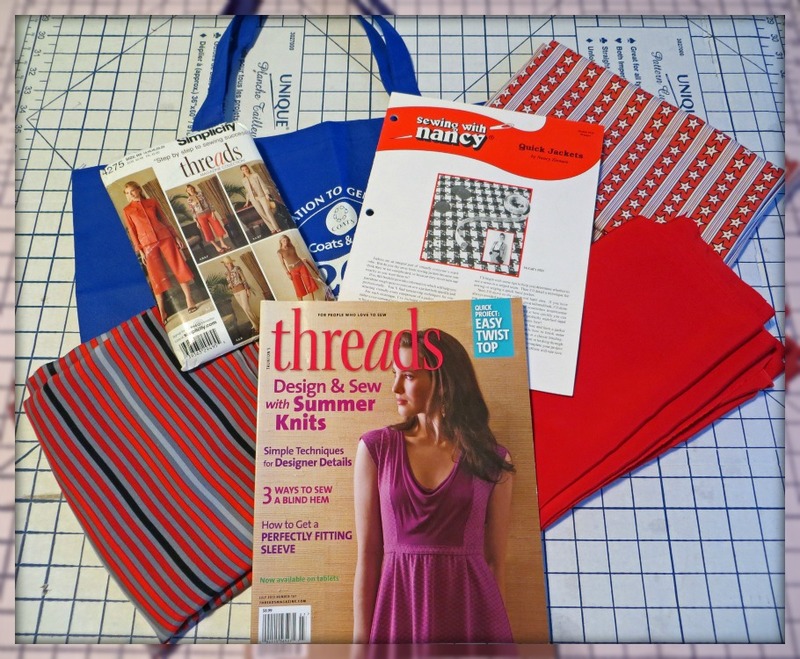 Sew Grateful Giveaway!! How about some Red and some Threads? I’m so delighted to participate in Sew Grateful Week hosted by My Happy Sewing Place! I truly feel blessed to have found a past-time that I love, that relaxes me, that challenges my brain, that allows me to be creative and that’s resulted in so many new friendships and connections both online and in the real world. And, at the end of it all, a new garment or accessory is the result. Win-win! 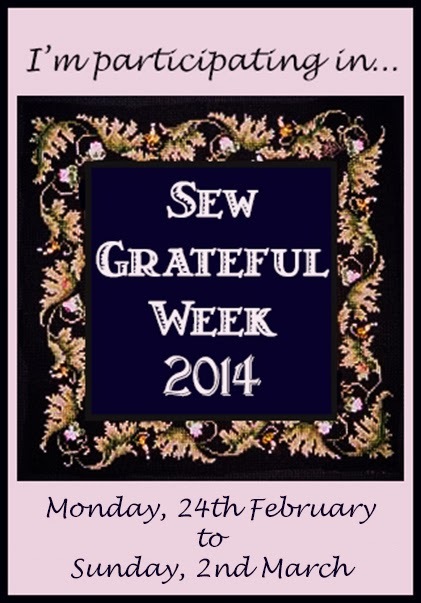 So, Monday’s task for Sew Grateful Week is a crowd favourite: A Giveaway! I’m so grateful for all of you and I would like to give you something. 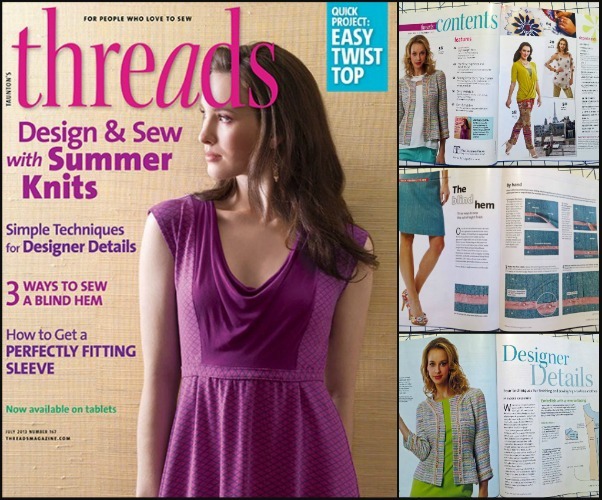 Simplicity 4275, Threads Magazine Collection Sewing Pattern. Includes: 2 styles of jacket / blazer, 2 styles of trouser, a short sleeve top and a belt. 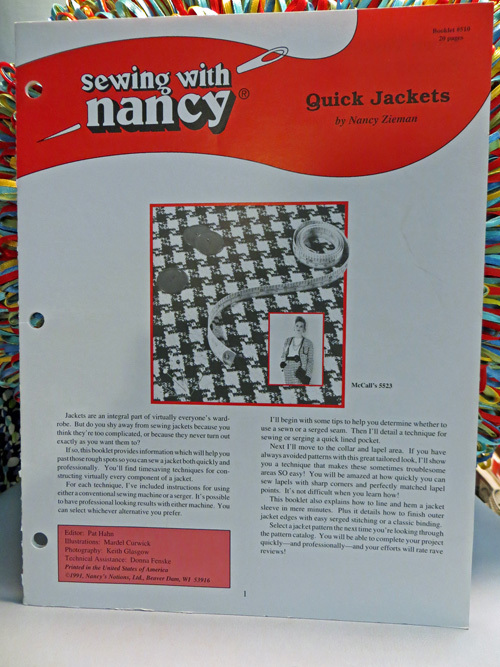 Sewing With Nancy Booklet: Quick Jackets by Nancy Zieman, Booklet #510, to help you sew your Simplicity 4275 Threads jacket. 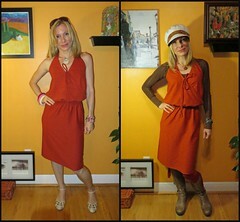 The first two fabrics played centre stage in a Red themed outfit I sewed for Sew Red October. 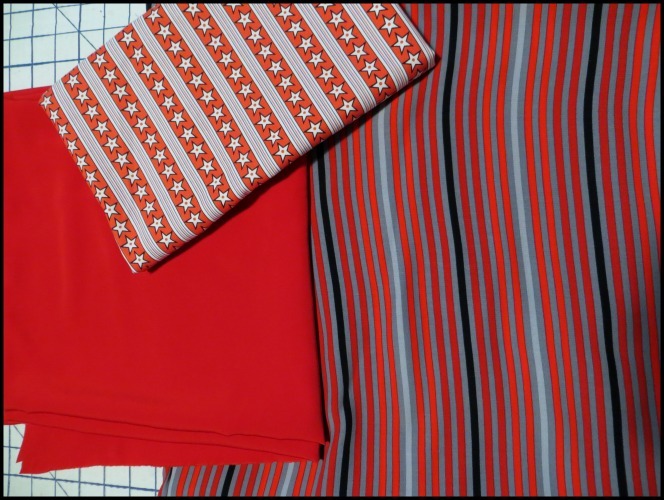 The solid red fabric and the striped fabric were used to colour block my By Hand London Polly Top and the striped fabric was also used to line the yoke and make pockets for my wide legged culottes. 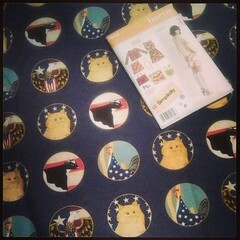 The stars and stripes fabric was used to make men’s pyjamas for my dad. Entries close on Saturday, March 8, 2014 (eastern standard time) which also happens to be International Women’s Day. Happy Women’s Day! In honour of this day, please leave a comment below telling us about a woman you find inspirational (real, fictional, dead or alive). And, if you enjoy my blog, don’t forget to follow it! Giveaway is open to everybody worldwide. Kitty will, once again, officiate the draw and select a winner so you can look forward to antics such as this or this or better still, this! Good Luck Everybody and Thank You. I Really Am Sew Grateful. Edit: Giveaway is now closed and the winner is posted here. You Think You’re Sooooooooo Bossy….But…. My mother has inspired me the most. She was dedicated to her family no matter what came up. She fought cancer, refusing to take pain meds at the end. She always stood by what she believed. So happy to hear Kitty will be officiating again! Is he accepting bribes? 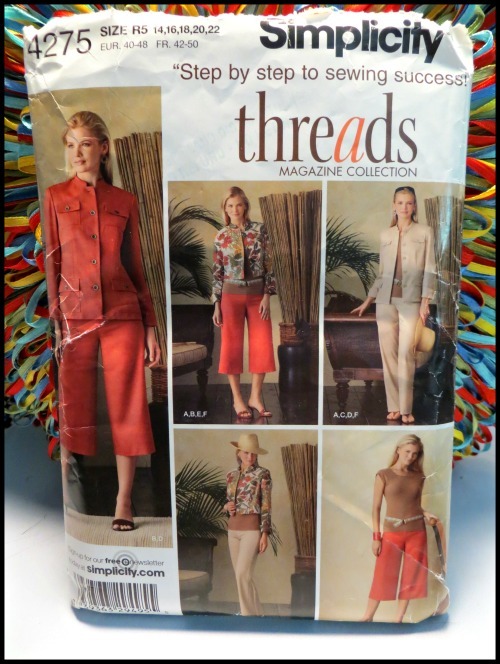 😉 This is a great selection of sewing “stuff”… Red and Threads! It all looks great! 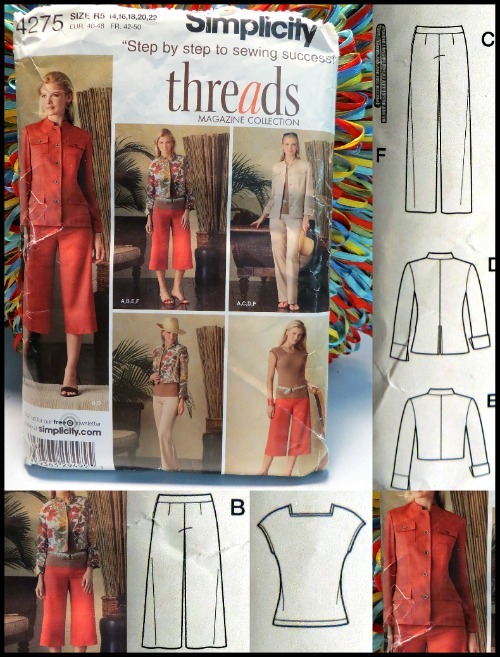 Those quick jacket tricks from Nancy I am sure will come in helpful and who doesn’t love a sewing magazine? Happy Sew Grateful Week! Ooh an irresitible giveaway! Threads and a pile of fabric in my favorite color! In real life my Mother is a constant example I can only hope to live up to. In fiction Kirsty in The Shepherd Girl’s Dream really inspired me. Steph of Sewing Cake and all the other indie designers and people making a living by their handmade goodness also inspire me! I’m inspired by a good friend who has six children and a disabled husband. Even though she is busy a nd under a lot of stress she is always cheerful! Oh, a give away how sweet of you. Tell Kitty that I worship cats over here. 😉 My Nana was a woman that inspired me. Not just by how she lived her long life and her many adventures but taught me to be true to myself and loved me for who I am. She grew up very poor in Ireland, and made an living by sewing for the wealthy in England, telling fortunes in the park on the weekend and working as a barmaid. When she married my grandfather she lived on dairy farm where they did not get electricity until the 80’s in it was in the cow barn. She taught me how to cook and sew without electricity and how to reuse almost anything. She died at 102 after calling me and saying that she thought she had seen everything she at meant to see. ……I will not be entering. Not because it’s not a fabulous giveaway but to give others a chance to win. Have fun! I’m glad you are out there blogging it all. Generous giveaway! I was inspired by a wonderful lady who was my first chemistry teacher, Mrs. Boschart. She made me realize why I love chemistry. I also owe a ton of inspiration to my mom and sister!! I have really come to admire my mother in law. Since the death of her husband of 45 years she has sold her house, moved to a new city and started another chapter of her life. It is really amazing to me that she continues to grieve but has made some serious life decisions to be closer to her grandchildren. Someone’s really going to score a nice bag of goodies and I can’t wait to see what you whip up with Kitty to pick the winner. I will refrain from entering since my sewing skills are no where’s near the skill level to make that pattern. I need a new machine before I attempt anything remotely tricky. Good luck to everyone. 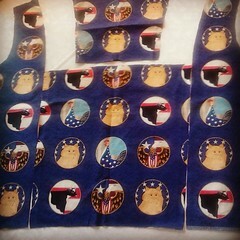 My aunt inspired me to sew. She was schooled in Europe before the War to be a seamstress. We still have her treadle sewing machine and I still remember her wearing dresses she made for herself without a pattern! I love red fabric and don’t get chance to sew it up very often. The person who inspires me is a good friend called Allison, she vas brave enough to give up work to pursue a writing career, her second play is now in production. She is an amazing lady and affirming of all creatives too. Great giveaway! I’m inspired by my husband’s Auntie Molly. She did an enormous amount for others and raised hundreds of thousands for Cancer Research, and she was also one fiesty lady! So many women who’ve inspired me. 🙂 I think one of the first was my Chemistry teacher back in high school – she was fabulous, didn’t care what other people thought, super intelligent, and clearly loved life. Great though your givewaway is, please don’t enter me as I’ve been given a final caution against stockpiling! I wanted to say a big thanks for your recent kitty comment. My Lemmy died shortly after that post, having got taken ill very suddenly aged 19. Though he didn’t feature much in my blog and wasn’t exactly photogenic, he sat on my lap as I typed most posts! Though she disliked cats, my inspirational female was my maternal grandmother. Her home-making skills were looked down upon by women of my mother’s generation and continue to be overlooked today but I was always sure of her unconditional love in turbulent times and she made me pick up a few sewing tips too. Ha, I know that caution well! I’m so sorry to hear of dear Lemmy passing. But, it does seem like a fitting end, to go swiftly and at the ripe old age of 19. He was obviously very loved and felt it. Kitty and I send out virtual hugs to you! Thanks for stopping by and for adding your comments. When I was 7, I entered school for the very first time. I couldn’t speak any English and was very shy. My form teacher, Ms Read who taught me all subjects except Chinese was extremely kind to me. I learnt to speak and write English from her and I did it very fast too. 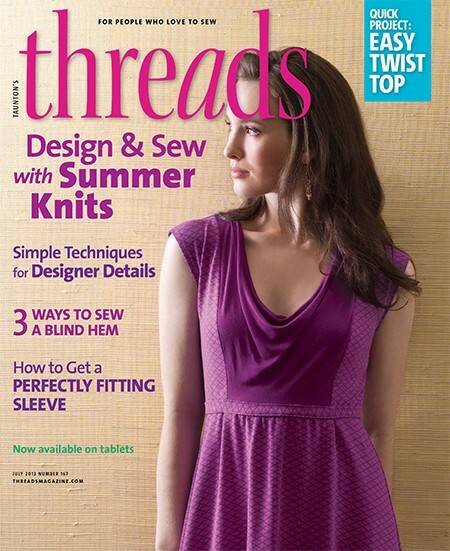 The best thing – she taught me to hand sew. My project was to sew blanket stitches on a dog applique to a piece of fabric which she later turned into a bag for me. Although she only taught me for a year, she changed my life forever. Hi! Thanks for your recent comments on my blog! His looks like a great giveaway, but I won’t be entering, as I am trying to destash (or ay least stop it growing…), and upi’d prefer that it go to someone who will use them! I think my inspirational female is my mum. It feels like a bit of a cop out, but she inspired me to sew and she inspires me to bring up my children as well as she did. In honesty, I think I get lots of little bits of inspiration from lots if different women, whether it’s style, attitude, approach to life, achievements, whatever! I didn’t have much inspiration from other women… other than my mother, I mean. She taught me so much, even if she didn’t have a higher education, and she is so open-minded for somebody of her generation, she always surprises me. Thank you for her giveaway! Wow, great giveaway! Just one woman?? Then I’d have to say my mum. She’s the kindest, smartest, funniest and most loving woman I know. And she taught me to sew! Thank you for your giveaway. 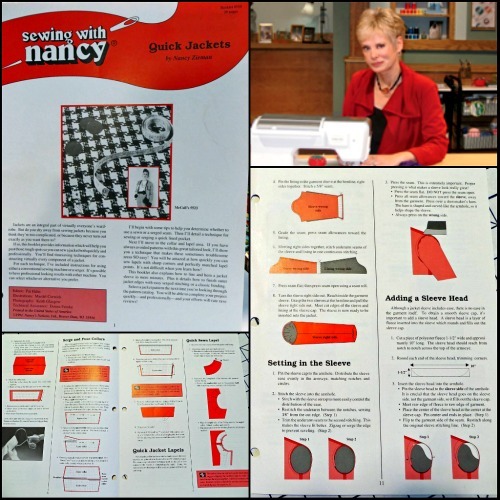 I was going to say my mother has and continues to inspire me to be the best I can, not to accept the glass ceiling, to be true to myself but I’m also going to add that since reading about Nancy Zieman in an extract from her autobiography, I found that inspirational in a sewing-related way. What a lovely giveaway – I think the idea of theme is so much fun and especially to theme it to International Women’s Day! Your question is an interesting one to me because I feel like I’ve always grappled with role models and mentors, especially the female kind. I never got along with my mom growing up and I tended to admire people like Angelina Jolie – NOT because she’s actress (I’ve only seen 1 or 2 of her movies) but because of the work she did for the UN and how she tried bringing awareness to women and children and unsafe conditions overseas. However I’ve never really been satisfied with answers like that… And I think I would have to say my mom has actually been the most inspiring. We think very differently, we argue all the time, and we tend to talk only a few times a year, however she’s a very strong person. She pushed me a lot growing up and while I hated it so much, I also learned to stand on my own and achieve anything I want. If I had some strange new goal (and I almost always did), after my mom told me it was a terrible idea, she would sit down and help me figure out how to get there. Looking back over her life as well, she went through so much, and then to raise 3 children (including my ungrateful self ;-)) and still come out on top, it’s very inspiring and shows me how much I can go on and do, even if I don’t make some huge worldly impact like Angelina Jolie. Yay mom! Thank you for giving us the chance to win those goodies! Everything seems really ineresting! After trying to think of an original answer, I’m going to have to go with my mother too! Hi there! Really great giveaway and I love the fact that you have combined it with International Women’s Day. So many women have, and continue to inspire me on a daily basis. But most of all the wonderful women in my family, mum, sisters, grandmothers and aunts…. All have been inspirational at various times (and some of them taught me to sew, crochet and knit!!). Please enter me to win! I’m going to go with my grandmother; she moved country twice with her family, sewed, knitted prolifically and also kept an excellent vege garden along with my grandfather. She also baked the most amazing bread which I really miss even now. Fab giveaway – I do love me some red! I’m inspired on a daily basis by what I see other people make, but for her patience, warmth and all round excellence as a human I am going to go with my mum, too. Now that I am a mother myself and having gained understanding on how hard it is, I have gained new respect my mother and all mothers everywhere and nominate her my hero. What a generous giveaway. A woman who inspires me is my favorite sociologist, Arlie Hochschild, whose work delves into gender and emotions. I feel her book The Second Shift, about the unequal division of domestic work in families where both parents work outside of the home, should be required reading for all young women. Incredible selection! There are so many women I find inspiring these days because never before women had as many opportunities in entrepreneurship and such success at reaching for their goals. I do in fact celebrate International Women’s Day, it is a unique holiday not known to everyone here in US. If I have to think about style inspiration, Ulyana Sergeenko (http://ulyanasergeenko.com) is definitely high on my list. She is a Russian designer who combines just the right amount of vintage, modern and feminine in every collection she creates. Thank you for a chance to be in the drawing. Put me in the hat! And add Betsy Johnson to the roster of inspiring women! I would love to enter please! I find so many women inspiring. i would vote for Betsy Johnson too. You are giving away a lot of goodies, that I would not mind having. Thanks 😀 like many others my mum inspires me, she always supported me and my brother but at the same time gave us the space to grow as people. Ooh, love that fabric combo! As a female scientist, I find Marie Curie to be very inspirational — she was so dedicated to her work and was recognized for it at a time when women in science were still dismissed as oddities. My grandmother, she taught me to sew. On a treadle. There are loads of inspiring women in my life, I feel so lucky. But like so many others I shall nominate my mum as being my biggest inspiration. She is amazing and apart from her beautiful personality it’s what she turns her hand to that is awe inspiring. I think it’s just electricity, gas and fire that she leaves to others, but for everything else I wouldn’t be surprised if she hasn’t tried at some point to make it herself: rugs, go karts, clothing, shelving, upholstery, lace… Jam, wine, and I could go on…..
Hello! I think I would have to say any of the Bronte sisters. How on earth did so much creativity exist in one family in such an out of the way community …. 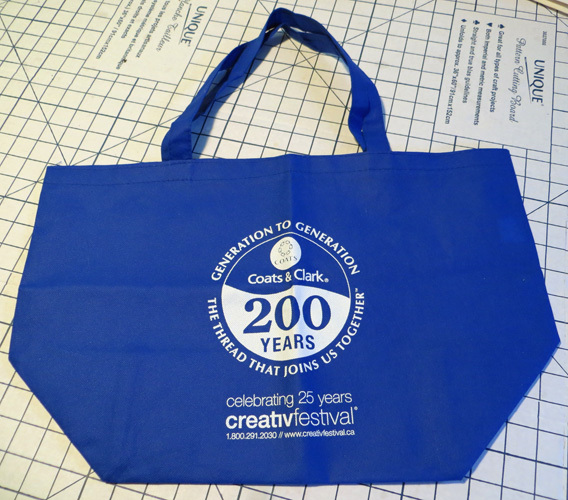 Anyway, love your blog and thanks for the chance to win! I am inspired by my grandma. She came from a low working class background and even though she moved up through the classes when she married my grandfather (to middle class) she never lost herself and she was very proud of her background and was very tight with all her 8 siblings. Like a lot of those other comments, I am inspired by my grandma, or as we called her, Gran gran. She was a botanist in the 1950s, helped people of all races register to vote, and was a well-known philanthropist in southern california. She always rejected the rules placed upon her and her family, and made something of herself. I will always look up to her. Thank you for the chance to enter this amazing giveaway! Like many of the people who commented, my Mom is also the most inspiring for me as she is very creative, smart and braves difficult challenges. She teaches me by example to be content, forgiving and patient. It’s great to hear everyone naming their Mum as most inspiration. The most inspirational woman I know is my daughter. She had a horrific accident last year and was in the burns unit for a month. She went back to Uni two days after her discharge, just dropping one paper as a concession to her injuries. Sha was back in the Chemistry Lab (she’s a science undergraduate) only a week after getting out of hospital. She’s learnt to live with her scars and is still the most beautiful girl I know. As a final act of determination she left her fellow students at the beach after New Year to come back to the city and make up that one paper she dropped last year so that she could still finish her degree this year. I am in awe of her determination in the face of disaster. Wow! What a giveaway. I can’t wait to see how kitty chooses this time! Go kitty, go, please choose me! Mind you, loads of equally deserving people have already commented. My inspiration would originally have been my mother when I was little, but she doesn’t sew much now. My current inspiration are all the lovely bloggers I follow like you, along with the those I get to chat and gossip too daily either via TMS or in my local WSBN. I consider myself very lucky! What a wonderful generous giveaway! Thankyou! And thankyou for giving me a chance to honour my mum as the most inspiring, hard working, caring, giving, loving woman I know. Blessings to all the mums, in fact, on International Women’s Day. What a great giveaway! My mother was the most inspiring woman in my opinion. When I was younger, she was always there for me giving me support, advice, and teaching me things that can never be learned in a school. Even now that I’m older, if I need any advice or just a word of inspiration, I know that I can count on her. And for that I am very grateful. Just at the last minute (actually, by my times one, I’m already too late!) I was simultaneously inspired and made to feel slightly depressed by a girl who was on my course at uni, when I read her article in one of the national papers about her experience last winter of spending 3 months living and working at a husky farm in the arctic circle. She just packed in her job for a paper and upped and went out there. Seriously, wow. And also, why have I not done anything more exciting since I graduated than sit at a desk?! Made me realise I need to get out and live life a bit more!